One in a lineup of five auctions scheduled across December 11th and 12th, John Moran Auctioneers’ Art of the American West auction will feature an array of Western and Native American items sure to appeal to collectors. The auction will be the second sale hosted on Wednesday, December 12th, and will kick off at 2pm. The Art of the American West catalogue is rife with Western genre works by a number of well-known artists. One of Edward S. Curtis’s (1868-1952 Los Angeles, CA) most iconic photographic images, “Canyon de Chelly – Navaho,” is offered with a $3000 to $5000 auction estimate. Sculptural works of art include a large-scale semi-abstract work in polychrome bronze by Santa Clara Pueblo artist Tammy Garcia (b. 1969). “Sisters” measures over six feet tall, and has been assigned a $15,000 to $20,000 auction estimate. The artist’s “Encounters II,” an abstract sculptural panel, will also be offered with a $5000/7000 estimate. Two works by ever-popular Arizona sculptor Dave McGary (1958-2013) are expected to perform well at the December 12th auction. 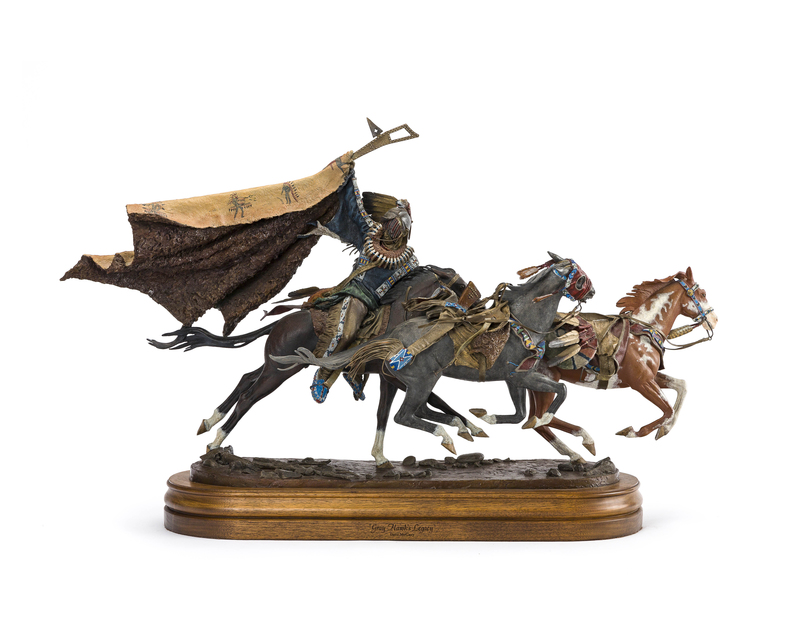 The dramatic “Gray Hawk’s Legacy,”depicting a chief on horseback holding a painted robe overhead hails from an important Park City, Utah collection, and is expected to earn between $7000 and $10,000. From the same collection, a charming polychrome bronze composition by wildlife artist Dennis Jones (b. 20th century) depicts a rhinoceros navigating a rocky landscape while birds perch on its shoulders (estimate: $500/700). A small selection of tack and other western items are expected to earn strong prices at Moran’s Art of the American West auction. A silver-mounted headstall with horse head rosettes will make a handsome addition to any tack collection (estimate: $4000/6000). A handsome Tex Tan copper-mounted parade saddle and headstall made for Prohibition-era gangster Joseph Zerilli carries a $3000 to $5000 estimate. A hitched horsehair bridle dating to circa 1910 features wonderful glass pictorial rosettes, and is estimated to bring between $2000 and $3000. A fun addition to any poker room, a pair of oak and painted glass saloon doors from the Kentucky Distillery are set to head to the block with a $2000 to $3000 estimate. Navajo wedding dress consigned from a local private collection. The two-panel dress dates to the mid-19th century, and features raveled cochineal and lac-dyed red yarns. The dress panels are presented in excellent condition, and carry a $20,000 to $30,000 auction estimate. A wonderful example of Apache figural basketry (an olla decorated with dogs and crosses), is expected to bring $2000 to $4000. An early 20th century Plains Indian beaded horse blanket in excellent condition has been assigned a conservative $1500 to $2500 auction estimate. Collectors of contemporary Native American craft will be pleased to see a handful of pottery pieces by well-known makers in the catalogue, including a Margaret Tafoya blackware vase with the artist’s signature bear paw decoration. A large example, the vase is expected to bring between $4000 and $6000. A large ceramic vessel by Santa Fe artist Richard Zane Smith featuring his signature textured motifs is sure to intrigue collectors whose aesthetics run more modern (estimate: $2000/3000). Sprinkled in among the offerings are wonderful pieces of Arts & Crafts design, including Handel lamps and Arts & Crafts furniture. Also expected to excite bidders, a hand-hammered Dirk van Erp copper lamp with mica shade carries a $4000 to $6000 estimate. All of John Moran Auctioneers’ events take place at their headquarters: 145 E. Walnut Ave. Monrovia, CA 91016. Moran’s will host five auctions across two days in December. On Tuesday, December 11th, Moran’s will kick the day off with the Rare & Important Timepieces from a Private Collection auction at 10am. At 12:30pm, Fine Jewelry will commence, followed by Studio Jewelry at 3pm. On Wednesday, December 12th, Moran’s Luxury Accessories will begin at 12pm, followed by Art of the American West at 2pm. Preview for all the December auctions will run December 7th through the 10th from 12pm-4pm each day. On Tuesday, December 11th, doors will open at 8am. On Wednesday, December 12th, the doors will open at 10am. For upcoming highlights, online catalogues, and more information on these sales, visit Moran’s website: www.johnmoran.com. Bidding is available online via Liveauctioneers, AuctionZip and Invaluable; by telephone; absentee; or in person. Consignment inquiries are always welcome.